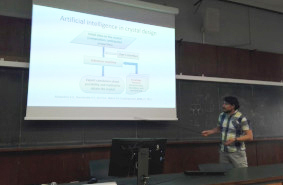 The Head of the Laboratory for the synthesis of new crystalline materials of the SCTMS Dr. Evgeny Alexandrov made a presentation at the scientific seminar of the Faculty of Chemistry at the University of Turin, which took place on March 11, 2019. Eugeny told colleagues about the topology of coordination polymers and made the short review on modern methods and computer tools for study, classification, prediction and design of coordination polymers. The methods were in general implemented in the program package ToposPro and associated topological databases. An invitation to speak at the seminar was received from Prof. Eliano Diana, with whom steps for collaboration were outlined and the range of tasks outlined. Namely, scientists discussed joint work in the synthesis of metal-organic frameworks in Russia and the study of the structure and their properties in Italy.